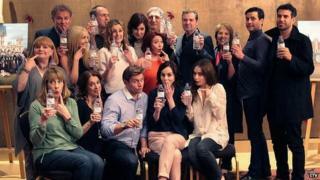 Downton Abbey's stars have posed with water bottles for a charity picture after a recent gaffe in which a plastic bottle was left in a promotional photo. The period drama made headlines when a bottle appeared in the background of a photo promoting its fifth series. That prompted ITV to release a second photo to support the charity WaterAid. "The cast and crew came up with the idea of turning some of this attention towards an issue around water that really matters," a statement said. In the original photo, the modern bottle was perched on a mantelpiece behind Hugh Bonneville and Laura Carmichael, who were in costume as the Earl of Grantham and Lady Edith. An ITV spokesperson said: "While the water bottle is in the uncropped version of a publicity photograph we can assure you that it will not be making an appearance on screen." WaterAid chief executive Barbara Frost thanked the show's cast and producers for their response. "It brought a really big smile to my face when the cast of Downton Abbey said that they wanted to support WaterAid's work," she said. "How fantastic that the attention created over one water bottle ends up benefiting some of the world's poorest communities through access to safe, clean water today."